The 2006 International Hydrology Prize has been presented to W.J. Shuttleworth by A. Askew, IAHS President, A. Szöllösi-Nagy, Director of the UNESCO Water Sciences Division and B. Steward, President of the WMO-CHy, representing A. Tyagi, Director of the WMO Hydrology and Water Resources Departement. William James Shuttleworth – Jim as he is known to us all - was born in the United Kingdom in the 1940s and from 1964 until 1971 he studied high energy nuclear physics at the Univer-sity of Manchester. He obtained a bachelors degree in 1967, a Masters in 1968 and his Doc-torate in 1971. He then spent a year as a research assistant in this same field before “seeing the light” and deciding to bring his undoubted abilities in scientific research and mathematics to bear on fundamental questions facing the hydrological sciences. Accordingly, he spent the next 21 years at the Institute of Hydrology in Wallingford where he rose to the position of Head of the Hydrological Processes Division. During this period Jim established several links with the scientific community in the USA and in 1993 he crossed the Atlantic on a more permanent basis to take up the post of Professor of Hydrometeorology in the Department of Hydrology and Water Resources at the University of Arizona, a position he holds to this day. In 1997 he added to his responsibilities that of Joint Professor in the Department of Atmospheric Science at the same university. Three years ago, he took on a further responsibility at the university as Director of its Science and Technology Center for Sustainability of Semi-Arid Hydrology and Riparian Areas. Jim is a Fellow of the Royal Meteorological Society, the American Meteorological Society and the American Geophysical Union, and a Lifetime Member of the British Hydrological Society. He has written or contributed to 20 technical monographs and book chapters and over 140 scientific papers. He has served on numerous scientific committees and panels, particularly those concerned with large scale water cycle and climate studies. For example, he is cur-rently a member of U.S. National Research Council’s Climate Research Committee, the U.S. National Committee for IUGG, the U.S. National Committee for the International Hydrology Program, and the Scientific Advisory Committee for the Large-scale Biosphere-Atmosphere Experiment in Amazonia. He also served for six years on both the Scientific Steering Com-mittee for the HELP Initiative and the Strategic Advisory Group for IAHS’ PUB initiative. He was a founding member of what is now IAHS’s International Commission on the Coupled Land-Atmosphere System and is currently an Associate Editor of the Hydrological Sciences Journal. This is a brief and factual summary of Professor Shuttleworth’s career, but it is not the reason for which he is being awarded the International Hydrology Prize for 2006. In the 1960s, hydrology was often regarded as a sub-discipline of engineering, geography or geology. It has now grown to become an important discipline of earth system science. Throughout his career, Jim has made major contributions to this evolution, both through inno-vative research and novel scientific thinking at the interface between hydrology and other earth science disciplines, and through his outstanding leadership of international research programs. In so doing, he has motivated a new generation of young hydrologists to move be-yond their established boundaries and work within hydrology as a major branch of earth sys-tem science. That is why he is being awarded the Prize this year. Early in his career as a hydrological scientist, Jim developed novel theories and experimental methods in the area of natural evaporation and his contribution to this field is so well recog-nized that he is regarded within the hydrological community as a leading international expert on the subject. He led the team which, for the first time, created the capability to make routine measurements of surface-atmosphere exchanges using the then-novel eddy correlation technique and as such is the father of the now huge international networks of surface sta-tions, such as Fluxnet, Euroflux Ameriflux, etc, that measure surface exchanges of energy, water and carbon using this method. Professor Shuttleworth was among the first hydrologists to understand the importance of hy-drologic science to climate and weather prediction. He was a pioneer, not only in improving the representation of surface exchanges in meteorological models, but also in seeking the data required to improve such representation. In the context of that work, and through inter-national entities including the World Climate Research Programme (WCRP), the International Geosphere-Bioshere Programme (IGBP), the International Hydrology Programme (IHP), and by organizing relevant symposia at IAHS General Assemblies, Professor Shuttleworth emerged as a leading member of the international community responsible for organizing the large multi-disciplinary research teams required to address these issues. Recognizing the growing need for safe water for an expanding world population, Professor Shuttleworth has, over the past decade, been a major advocate for the directed deployment of hydrological understanding in support of societal needs. As mentioned earlier, his contri-butions have been critical to the creation and development of the Hydrology for Environment Life and Policy (HELP) initiative, which is jointly sponsored by UNESCO and WMO, and the Prediction in Ungauged Basins (PUB) programme of IAHS. In summary, Professor Shuttleworth is widely recognized for his innovative, international leadership over more than thirty years, contributing to the growth of hydrology into a major discipline of earth system science. It is therefore with great pleasure that, together with WMO and UNESCO, the Association awards him the International Hydrology Prize for 2006. I am sincerely grateful to the International Association of Hydrological Sciences, the UNESCO International Hydrological Program, and WMO Hydrology and Water Resources Program for jointly bestowing upon me the huge honor of receiving the International Hydrology Prize for 2006. I am humbled by the generosity of the citation; I appreciate enormously the initiative of my friends in nominating me, and gratefully acknowledge the support of hydrological colleagues in the several IAHS National Committees worldwide who supported my nomination. 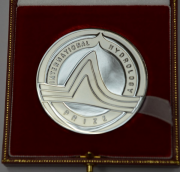 I recognize the International Hydrology prize as the most prestigious award that can be made for contributions to hydrological science and engineering, and it is a source of immense personal pride that my name will now join a comparatively short list of those whom I have for many years respected as the international giants in hydrology. I share this pride with my family, many of whom are present here today. I share it with my wife, Hazel, my lifelong partner and friend; my four sons, Craig, Matthew, Nicholas, and Jonathan; my daughter, Amy, and daughters-in-law, Emma and Catherine; and my eight grandchildren. I also share it with my ex-colleagues at the Institute of Hydrology and current colleagues at the University of Arizona and the SAHRA Center, and with all my fellow travelers in the journey of life, the outstanding scientists in numerous countries with whom I have personally shared the great adventure of scientific discovery. It is with particular pride that I accept this honor in the context of Intergovernmental Council for the International Hydrology Program and on behalf of the U.S. hydrological community as a whole. It is particularly relevant that a U.S. hydrologist is receiving the IHP in this setting this year, because the United States has recently established the U.S. National Committee for the IHP and I serve on this committee. We look forward to contributing to IHP by providing recommendations to the U.S. National Commission for UNESCO in the area of hydrology and, in due course, to the United States once again playing a full and active role in the Intergovernmental Council of IHP. In his citation, President Askew spoke of my contribution over many years in the form of theories and experimental methods in the area of natural evaporation. It is true that since I first became a hydrologist, or more correctly a hydrometeorologist, the complex problem of understanding and describing mathematically the processes that control the movement of this “invisible” form of water have provided an intellectual challenge and consistent component in my research. They still do today. In retrospect, it is amazing to see just how far this subject has come during my career and it has been great fun to contribute to that growth in understanding and to the capability to measure evaporation routinely. In his citation, President Askew also spoke of my providing international leadership through a transition period that has involved immense growth in the scope, participation, and importance of hydrology. Hydrology has now become not only a major component of earth system science but, in my mind, the most important and relevant component. Let me respond to Arthur’s generous praise by speaking of privilege. I celebrate the privilege that I have had by belonging to a generation of hydrologists who have had the extreme good fortune to live and work during a period when hydrology grew by exploring its interface with other environmental sciences, and by learning to communicate and work effectively with other environmental scientists. If, as President Askew says, I was among those who first recognized the importance of hydrology interfacing effectively with other earth science disciplines, and if I contributed leadership during the change, this was my privilege and my pleasure. The truth is that water is an important aspect of many processes in the different earth science disciplines. Consequently, for scientists in other disciples, working alongside hydrologists is not just essential, it happens naturally and easily. Water is, for example, arguably the most important influence on the geomorphic evolution of the solid earth. Water is the primary mechanism by which energy is exchanged between the earth’s surface and the atmosphere above, and a crucial aspect of energy transfer within the atmosphere. There is a greenhouse effect, it is part of the natural climate system and water vapor is the primary greenhouse gas. Without it the earth would be several tens of degrees cooler. It is uncertainty in the effect of water related processes in the atmosphere that is the primary cause of ambiguity in computer model predictions of future climate. Over the last few decades we have come to understand better how changes in oceanic surface water temperature, such as El Nino, are related to changes in precipitation and hydrologic flows over land, and how intimately related are the ecological and hydrological process that occur in the natural environment. This is true everywhere, but it is particularly true in the semi-arid environments which cover approximately one third of the globe. The growth in understanding of how important water is within the earth system has been massive over the last three decades. Much is now known, but much is still to be learned. But water is not just a critical controlling aspect in the processes that govern the complex earth system that is always changing, through both natural and human influences. Water is also usually the most important medium through which the earth’s environment influences human welfare. The sustained provision of safe water for human use is a priority in a world that is changing in response to increasing population pressures on water systems. If, as stated in the citation, I have helped to raise consciousness of the need to improve communication between the physical and biological sciences and the human sciences, and of the need for the directed deployment of hydrological understanding in support of societal needs, this is a further source of pride to me. Finally, the citation speaks of me motivating a new generation of young hydrologists to move beyond their established boundaries and work within hydrology as a major branch of earth system science. Let me respond to this, and conclude, by offering the same three pieces of advice that I gave once before to young scientists on a similar occasion. First, in one’s progress through life there are basically two ways to proceed: either to take safe, small steps or make risky leaps forward, recognizing that in the latter case one is bound to fail about half of the time. In my experience, the latter way ultimately leads to more rapid progress and is certainly more exciting! Do not be afraid of risks. Second, as a young scientist, respect the established peers in your field, and listen to what they say, but don't necessarily believe them! Always question. Finally, and perhaps most importantly, remember that it is very difficult to keep your own end of the boat afloat while trying to sink the person at the other end. Water is the life-blood of the earth system, and water is a commodity we necessarily all must share. In this respect, we are all in the same boat. Distinguished colleagues, I thank you once again for the immense honor of awarding me the International Hydrology Prize. I accept it with pride and I will treasure it.